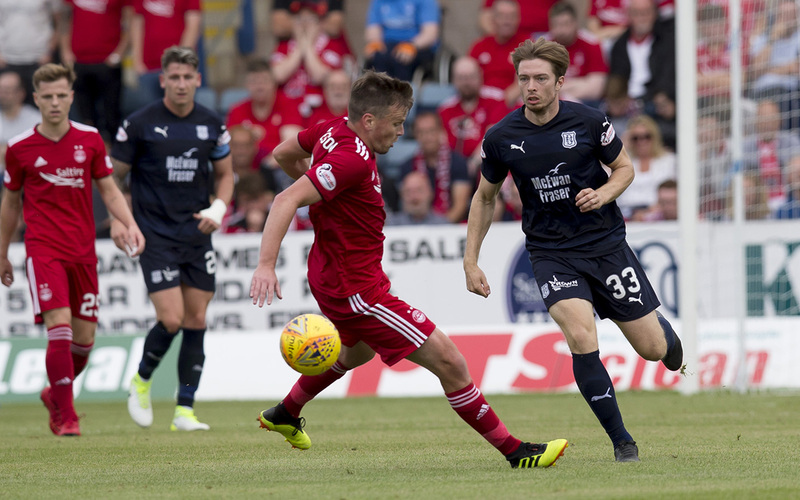 Aberdeen edged out Dundee in a 1-0 win at the Kilmac Stadium at Dens Park this afternoon. Gary Mackay-Steven’s second half penalty proved decisive. The Dark Blues had good chances but their failure to turn them into goals proved costly. Dundee made two changes following last week’s defeat at St Mirren. Genseric Kusunga and Nathan Ralph came in for Steven Caulker and Cammy Kerr, who were on the bench. Aberdeen’s only change was striker Stevie May replacing central defender Scott McKenna, with Graeme Shinnie moving from midfield to left back in the place of Andrew Considine, who switched to central defence. It took 10 minutes for the first serious effort on goal when Kharl Madianga sent a fierce 22 yarder fizzing a foot over the crossbar. The Dark Blues seemed content to play their way gradually into the match and were competing effectively in midfield. Hard working and organised, Dundee kept their shape well when the Dons had the ball and Aberdeen found it difficult to turn possession into chances. An Aberdeen free kick from out wide produced a brief scramble in the six yard box but the defence flung bodies in the way to block and clear. Jesse Curran opened up the Dons’ defence when he broke up an attack and raced clear from his own half. After reaching the Dons’ penalty area he cut the ball back for Sofien Moussa who skyed a good chance high and wide. Aberdeen had 10 corners in the first half alone. These were mainly from tackles on their wide players and defenders blocking crosses rather than close things round the Dee goal. The Dons created surprisingly little from these corners, all of which were dealt with effectively by the home defence. Late in the half Aberdeen managed to create a couple of openings in the Dundee penalty area. The ball broke to Graeme Shinnie wide on the left and his low cross found Sam Cosgrove, whose weak shot was easily gathered by Jack Hamilton. Stevie May did better with a more difficult chance after good play on the left by Shinnie and Gary Mackay-Steven. His quick turn and shot was saved well by Hamilton. Lewis Spence needed treatment for an injury and was kept in the changing room at half time. Adil Nabi came on to play behind the strikers with Paul McGowan moving to right midfield and Kharl Madianga dropping into the holding role. Dundee should have taken the lead only a minute into the second half. Josh Meekings failed to connect properly with a free header only a couple of yards from goal and the ball sailed wide with the supporters expecting it to crash into the net. At the other end Meekings sliced a May cross, sending the ball looping across goal. Fortunately it was too high for Cosgrove who couldn’t direct his header on target. Adil Nabi was quickly involved in the game with some creative passes. Moussa collected one and showed a lack of composure, swiping an angled shot well wide when he had time and space to find a better position. Jean Alassane Mendy was next to fluff a good opening. After he was involved in a good build up with McGowan and Moussa he hooked a poor shot across goal and wide. After wasting these chances the Dark Blues almost gifted Aberdeen a soft goal. Nathan Ralph made a mess of a clearance, setting up Dons’ substitute Bruce Anderson, who smashed a volley against the crossbar from 12 yards. Aberdeen were given an even better chance from the same distance when the referee decided Genseric Kusunga’s raised arm connected with the ball as he challenged Andrew Considine at a corner. Gary MACKAY-STEVEN rolled the ball into the corner of the net from the penalty spot. The goal was after 74 minutes and it always looked like that would be enough for the Dons to take all the points. With a lead to defend Aberdeen were more composed and careful at the back. Dundee struggled to get good balls into the Aberdeen penalty area. The only time they set up a clear shooting chance was when Moussa found Curran in space on the right. Nabi met the cut back with a powerful snapshot, but Joe Lewis saved well, turning the ball round the post. Dundee created some great openings today, but this Nabi effort was their only shot on target. That stark fact explains why the Dark Blues lost. The approach play was often very promising with some good, inventive and determined attacking. Everything fell apart when it was time to shoot. The finishing was invariably wild. Nobody had the composure to force a save at least out of Joe Lewis till Nabi’s late shot. Two defeats from the opening two games is a bad start to the Dee’s league seasons. The defeats have been by fine margins, but they have not been down to bad luck. A few mistakes at either end of the park have been costly. 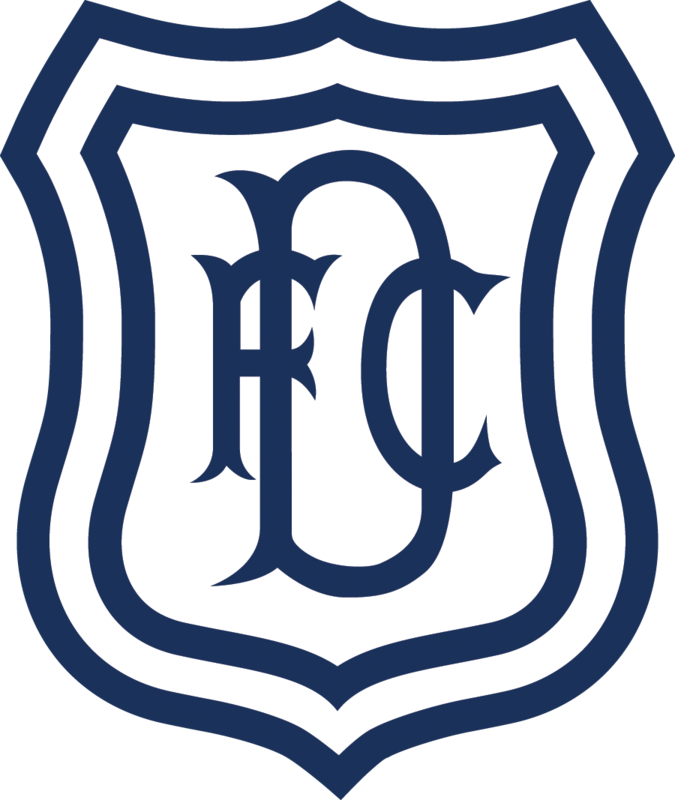 The simple lesson is that Dundee will have to produce better finishing. There have been encouraging signs in midfield, but that counts for little without an end product. Unused subs: Cerny (gk), Ross, Campbell, Harrington. Booked: Ferguson (foul on Madianga), Devlin (foul on Moussa), Gleeson (foul on Ngwatala). Referee: Bobby Madden. Assistants: Alastair Mather, Graeme Leslie. Fourth Official Steven Kirkland.